A Fairfield Wedding Photographer is able to captures images from a myriad of excellent venues and spaces in Fairfield, Connecticut. A wedding day should be a celebration that is unique the couple at its center. As a day filled with so much activity, family, and friends, it is important to remember the real reason for the event, especially as a Fairfield Wedding Photographer. The day is about two people, joining together in love and joy, promising to spend the rest of their lives in faithful devotion. This image shows a wedding at a private residence in Fairfield. The house in the background is grand, but still appears quaint and maintains an air of charm. White flowers hang from the wrap around porch, a symbol of this beautiful spring wedding day. At the center of the photo the two grooms hold hands, laughing in the jubilance of the moment. The couple stands under the canopy of a chuppah, for a Jewish ceremony. The chuppah represents a Jewish home, symbolized by the white cloth canopy and the four wooden poles. 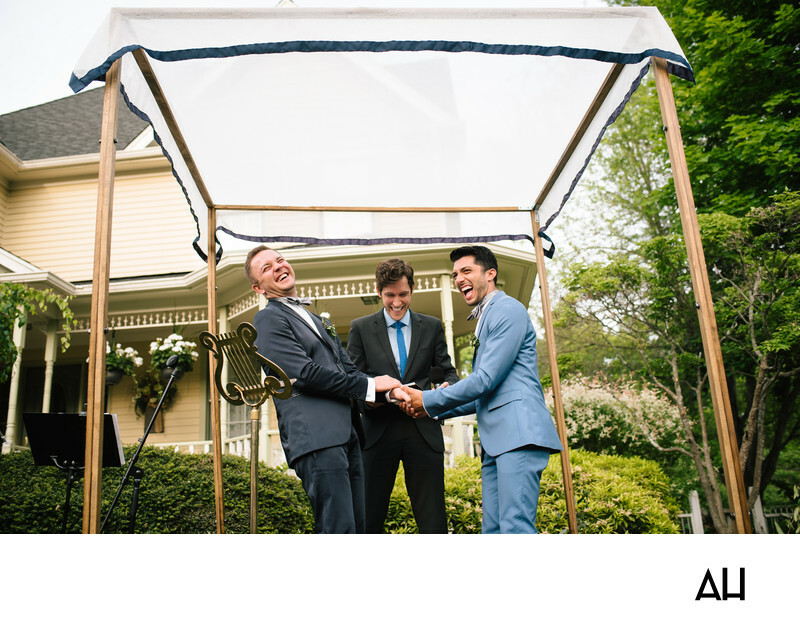 A chuppah is meant to be open on the four sides to express hospitality towards all guests. This is not a totally traditional Jewish ceremony, but the grooms wanted to keep some of the religious customs intact. The ceremony is performed by a friend of the grooms, who jumped at the chance to join these two men in marriage. At the moment of the camera flash, the friend had just made a joke and sent the couple and guests into rolls of laughter. This was a day full of moments such as these, overflowing with mirth and love.